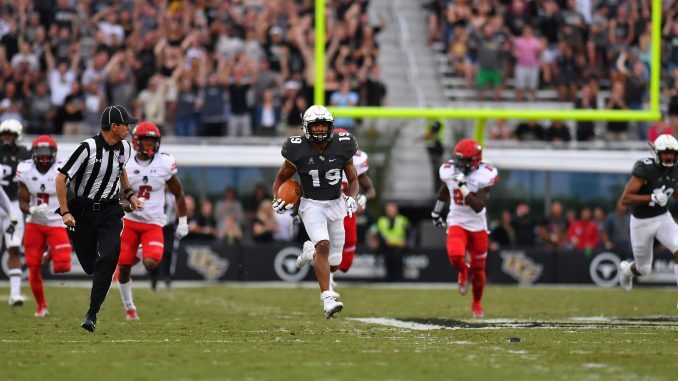 At 7-0 overall and 4-0 in AAC play, UCF came in at No. 18 in the season’s first College Football Playoff rankings. The Knights, who are currently ranked No. 14 in the Coaches Poll and 15 in the AP Poll, are in the playoff rankings for the first time ever. The rankings came into play in 2014, as college football switched from the BCS system to a four-team playoff. The top four in the rankings earn the right to play for the National Championship, but there are four other prestigious bowl games up for grabs. The top games are dubbed the “New Year’s Six,” since they are played on New Year’s Eve and New Year’s Day. The Power Five conferences are given the most access to big bowl games, but the highest-ranked Group of Five team also receives a bid. Since the Knights came in at No. 18, they would currently be in line for the bid. The only other Group of Five team in the rankings, which are released every Tuesday throughout the rest of the season, is Memphis (No. 23). USF is on the outside looking in at the moment, but could make the leap by winning the rest of its games. Two years ago, Houston took the bid at No. 18 and beat No. 9 Florida State in the Chick-Fil-A Peach Bowl. Last year, it was Western Michigan at No. 15 falling to No. 8 Wisconsin in the Goodyear Cotton Bowl Classic. UCF continues its journey this Saturday when it heads to SMU (6-2, 3-1 AAC). Kickoff is set for 7:15 p.m.